We’ve been in our rustic beach cottage a little over 4 months now even though I’ve decorated and organized a few spaces, one space that I’m really excited about decorating is my daughters room. I want her space to be feminine, yet still have a vintage chic vibe. Since I was going to transform a room anyway, I decided I would participate in an event called the One Room Challenge. 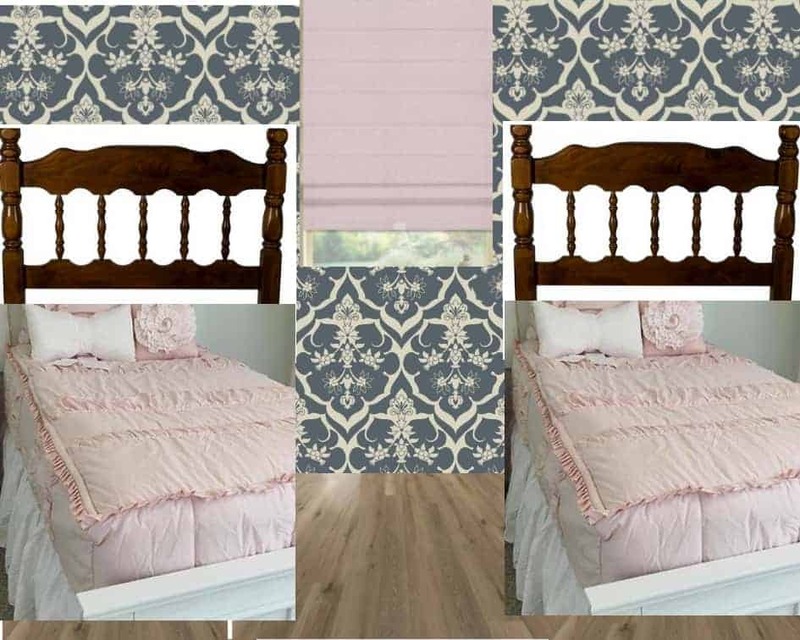 Are y’all ready to see the plans for my little girls Vintage Chic Bedroom Makeover? 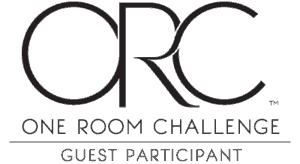 If you stumbled upon my corner of the internet world from the One Room Challenge site, I wanted to say Welcome! My name is Lindsey and I’m just a souther gal with a desire to create. My goal for Repurpose and Upcycle is easy DIY projects, furniture flips and budget friendly home decor tips. I’m glad you’re here! Do y’all know what the One Room Challenge is? It’s a challenge where bloggers from all over transform one room in 5 weeks. 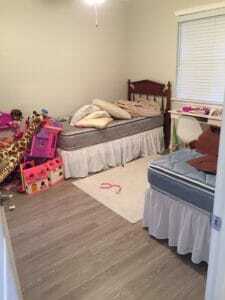 I can’t wait to share my daughters bedroom makeover with you. 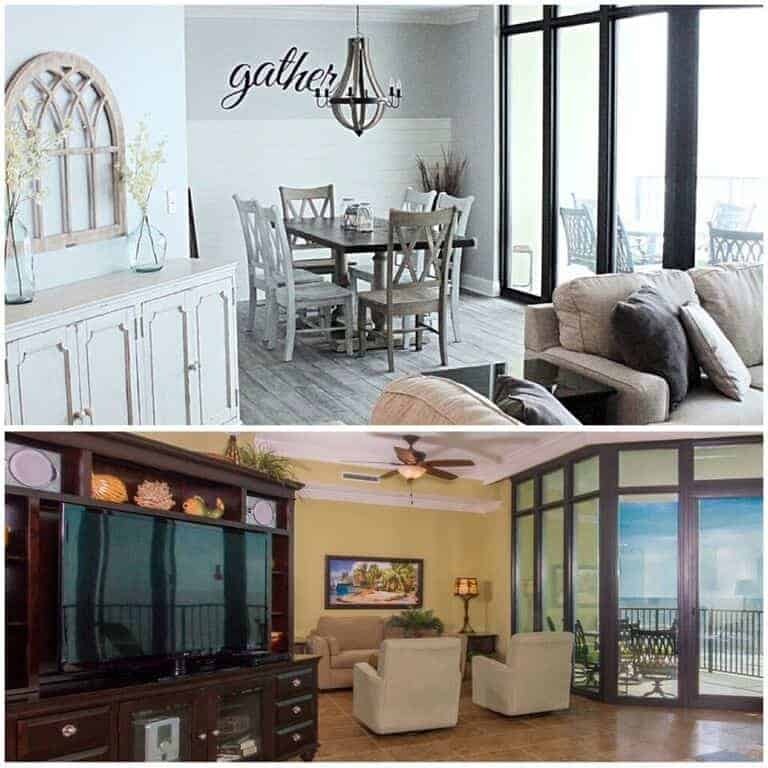 While you are here, click HERE to see other bloggers room makeovers too! 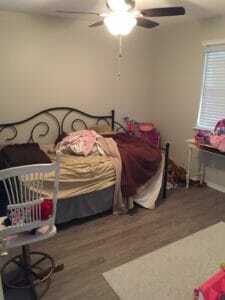 Let me show you the current state of Emerie’s bedroom (aka the disaster room!). I’ve got a lot of things on my to do list for this space. One of my goals for this space is organization her toys, making an environment that she wants to play in, and creating a lovely inviting space. 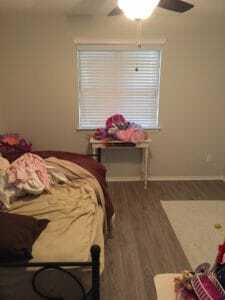 I can’t wait to show you what I have planned for my daughters room makeover. Ready to see a very rough mood board for the new space? I’m sure the plans will change, but I wanted to get a quick idea of what colors I wanted to use in her bedroom. I did bring the antique twin beds in and swap them out for the double day bed. I think they fit much better in this space. As she says “now I can have a swumber party.” Oh boy, I don’t know that I’m ready for that yet. This week I created a set of DIY rain gutter book shelves, which are super functional and look great! One project down, like 10 to go! Thanks for following along. I’m looking forward to this! This will look so cute when you are done. I like the rain gutter shelves. I adore the inspiration pics so I will be following along with you! Its going to be darling I’m sure! Thanks Libbie! I’m excited to see how it turns out. Those rain gutter bookshelves are so clever!! That is one lucky little girl. 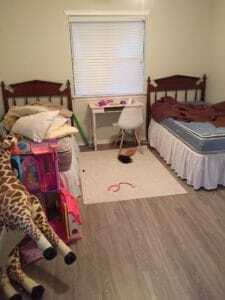 I wish I could’ve done things with my children’s rooms. I had two boy & two girls, but the age span was one end to the other. Girl – boy in one age bracket and Boy – Girl in another! Geesh! This is really gonna be sweet! Glad you have the opportunity! It’s going to be great! The book shelves are the icing on the cake. Thanks for sharing with SYC. Redoing the bedroom is a big job! 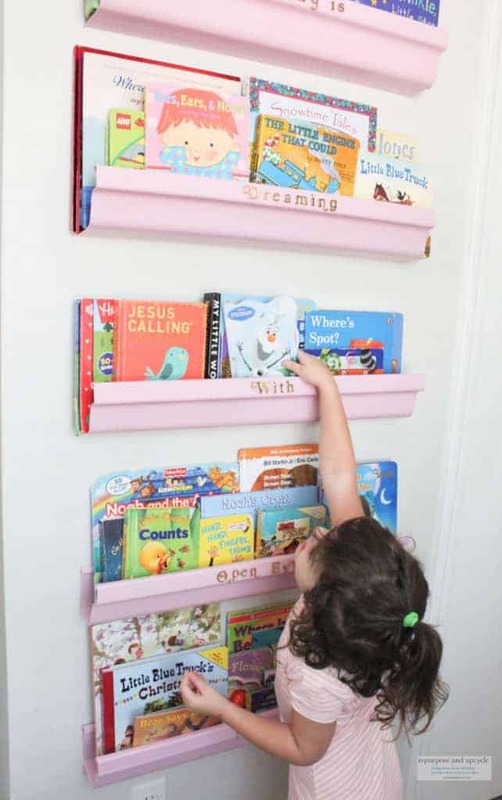 I love the pink rain gutter book shelves! Thanks for sharing at our Party in Your PJs link party! That’s going to look great! We’ll definitely be following along. 🙂 Thanks for sharing this with us at the Homestead Blog Hop, please give us all the updates as you go!